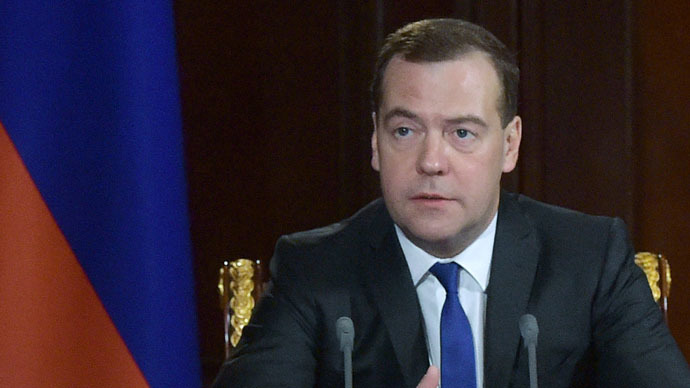 “I signed a special document, it restricts the admission of certain types of foreign-made machinery into federal and municipal auctions”, Medvedev announced during a meeting with deputy prime ministers Monday. The ban “concerns primarily construction equipment and mining machinery, as well as utility equipment and other types of vehicles,” Russian Deputy Prime Minister Arkady Dvorkovich said. Each type of banned machinery already has a “Russian- made version,” he said. Machinery made in the countries of the Eurasian Economic Union (EEU) is an exception. "The machinery from EEU countries will be delivered just as Russian-made vehicles,” Dvorkovich added. Last Tuesday, Russian Prime Minister Dmitry Medvedev signed a one-year anti-crisis plan costing at least $35 billion, aimed at stabilizing the slowing economy. Import substitution has become one of the key economic issues for Russia after the outbreak of the so-called “sanction war” with the West. Russian Finance Minister Anton Siluanov estimated the Russian economy was losing about $200 billion from a combination of sanctions and plummeting oil prices. Western sanctions were a 'dead-end track,' but Russia has been forced to respond to the measures taken by the Western countries, Medvedev said. On Thursday, the European Commission decided to extend sanctions against Russia through September 2015. In August 2014, Medvedev signed a decree banning the import of beef, pork, poultry meat, fish, cheese, milk, vegetables and fruit from Australia, Canada, the EU, the US and Norway. The Russian PM added that Moscow still had a lot of trade partners abroad, which it had not placed on the retaliatory sanctions list. Then in September, Russia considered import restrictions on Western cars and clothing in response to the sanctions against Moscow.